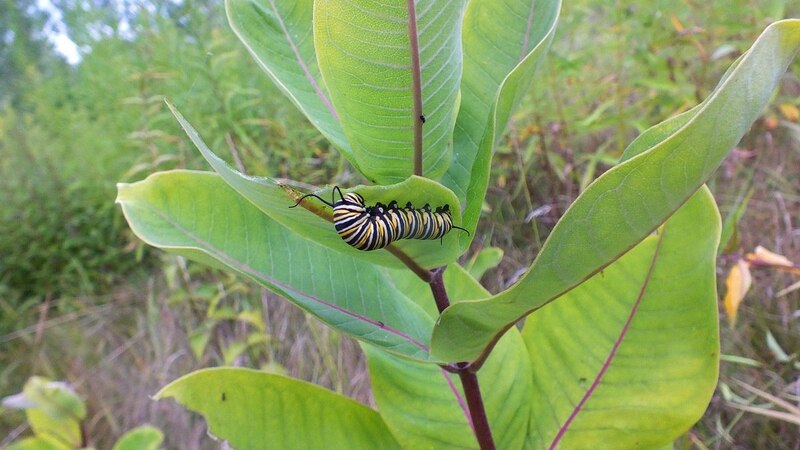 On a nice outing to Tommy Thompson Park in Toronto, Ontario, we finally succeeded in locating some of this year’s crop of Monarch Butterfly larvae …ten in fact. We were ecstatic. 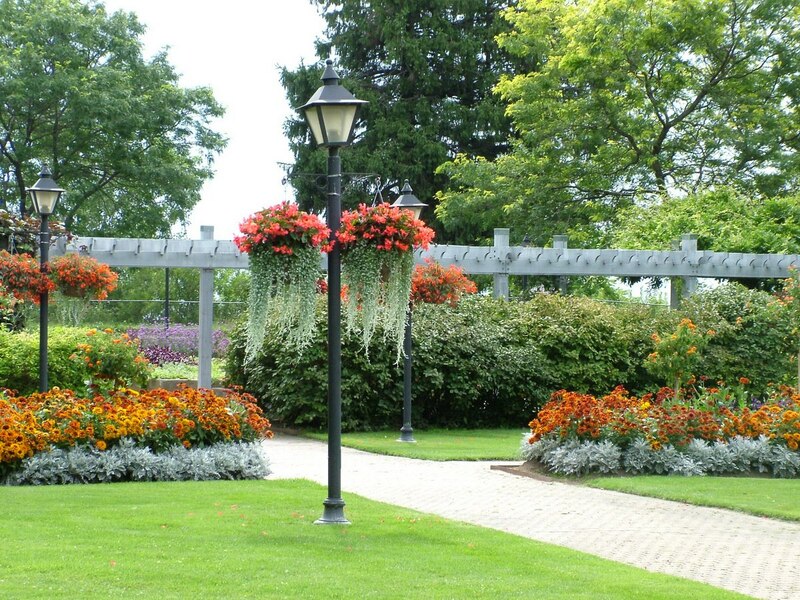 Our day actually began with a stop at Rosetta McClain Gardens in northeast Toronto to see if any butterflies or dragonflies had begun to assemble there before migrating across Lake Ontario. The ever popular Butterfly Bushes were mere shadows of those that had lined the perimeter of the rose garden last year, so not quite the draw they had been. Still, we came up with a Red Admiral Butterfly, one Monarch, a Painted Lady and several Cabbage Whites plus one Green Darner Dragonfly. Not to be deterred, we drove downtown, grabbed a bite of lunch then continued over to Tommy Thompson Park. The early morning sunshine had given way to a threatening sky. 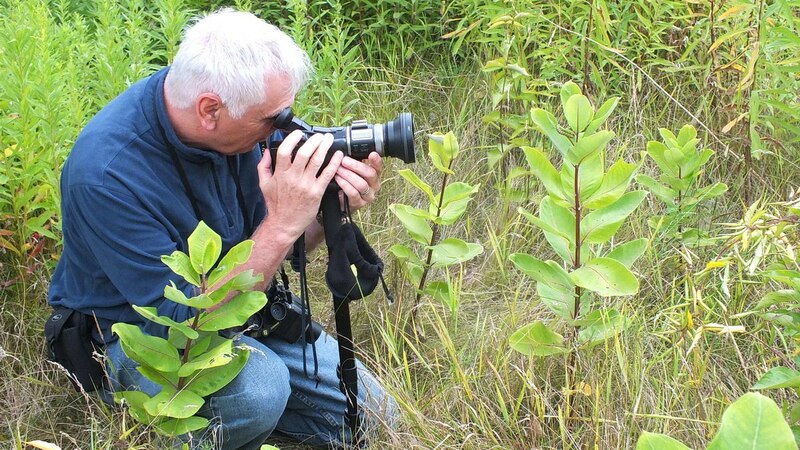 Bob and I were keen to inspect any Milkweed plants that grow along the trails, and we did not have to walk far before we found one large grouping of them. Thank goodness this first monarch butterfly larvae that I spotted was in plain view because we soon learned that a lot of them were much more difficult to find. 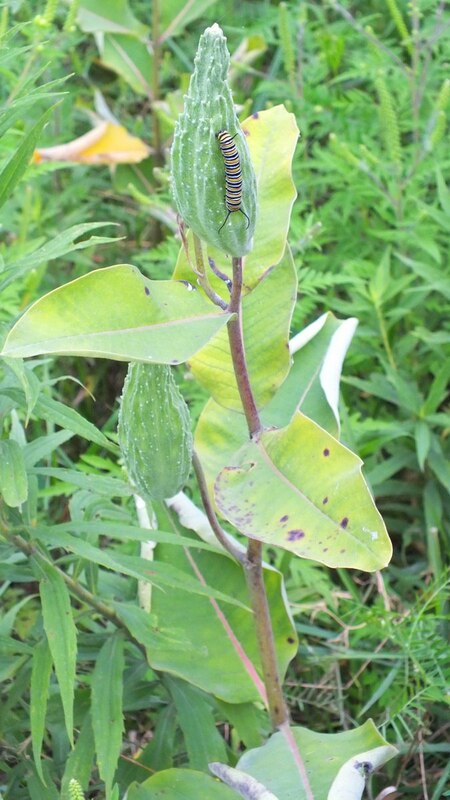 I was rather surprised to see the caterpillar on the seed pod of the milkweed plant rather than on a leaf. 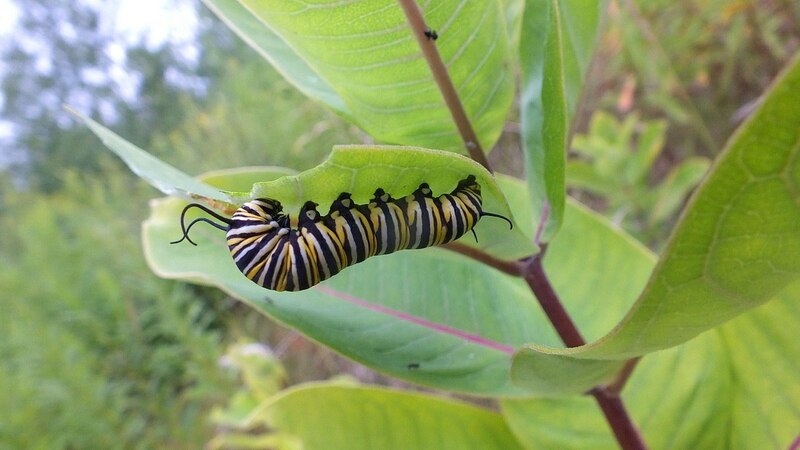 Over the course of our time spent seeking the monarch butterfly larvae, we also came to the realization that the caterpillars only seemed to be populating the Milkweed plants that had red stems. 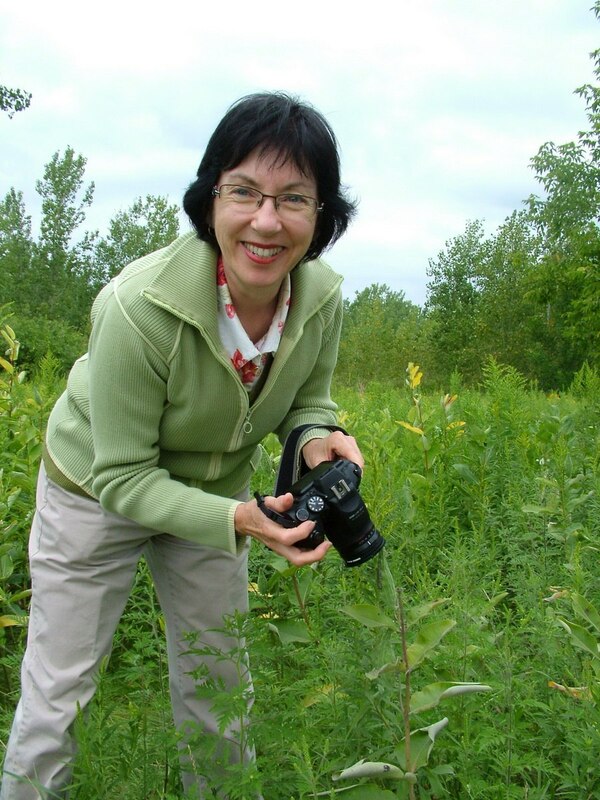 I have learned that there are over 100 species of Milkweed plants. I do not profess to know what species these ones are, but they supported the needs of every caterpillar that we found that day. 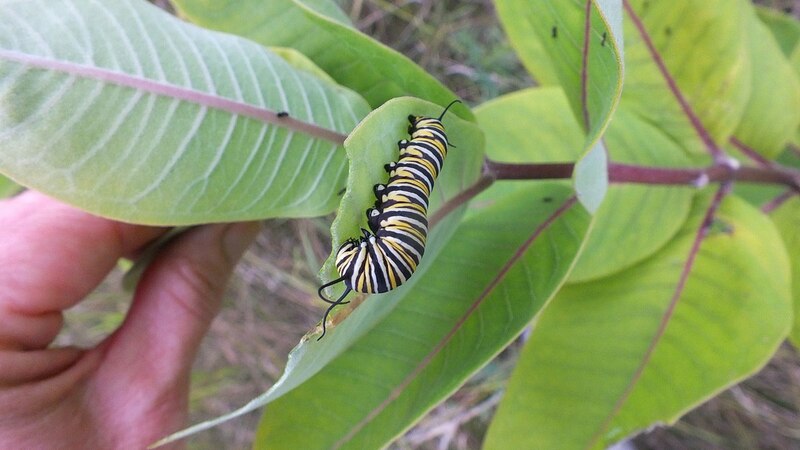 As we carefully circulated amongst the Milkweed plants, it was crucial to be very careful so that we didn’t inadvertently break off any of the stalks. 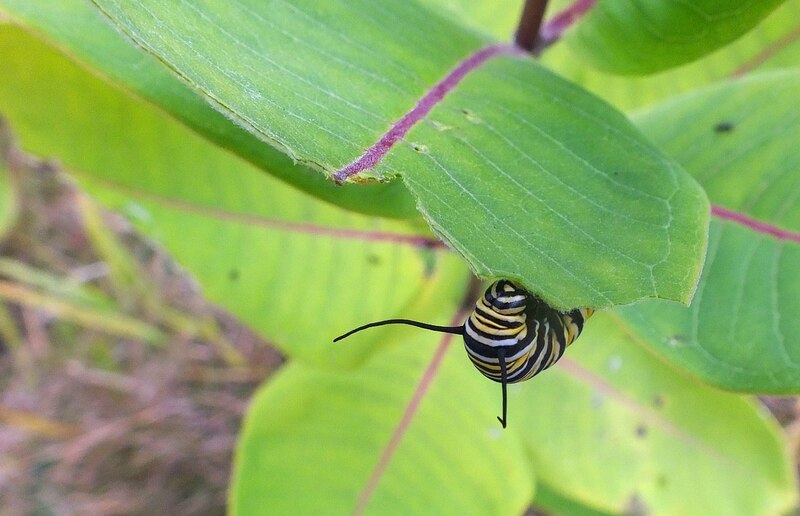 We were crouching and bending…in truth hoping to find a chrysalis dangling from one of the leaves…in order to scrutinize each and every plant in any given swath of the robust plants. 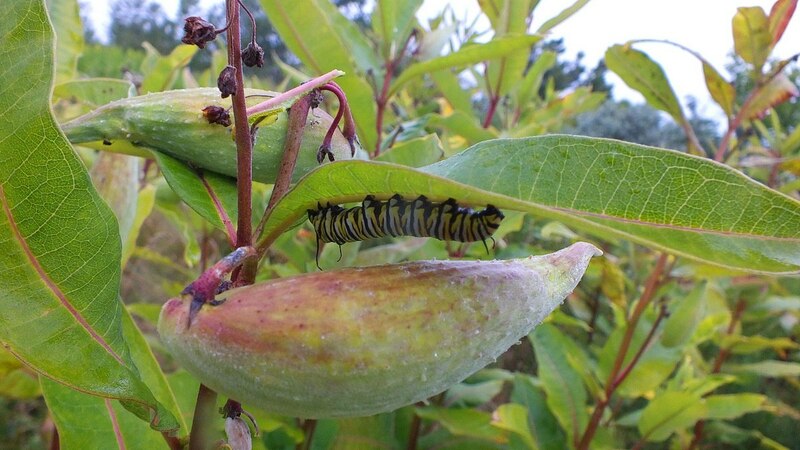 When I uncovered the second Monarch Butterfly larvae, we were really encouraged to think that, there, on the Leslie Street Spit on the Toronto waterfront, the conditions were so perfect as to appeal to the Monarch Butterflies that had deposited their eggs on those plants. The larvae were of differing sizes indicating that some had been hatched for a longer period of time than others. This particular caterpillar was close to 3 inches (7.5 cm) long and was contentedly munching on its host plant. 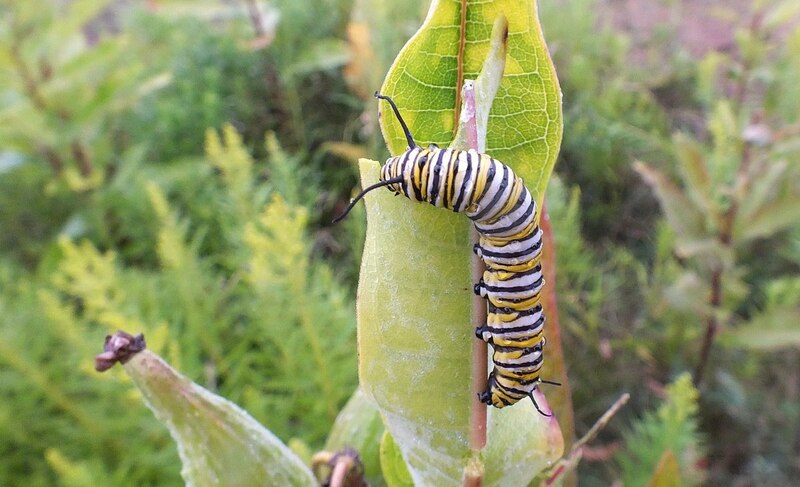 Considering that each of the larvae we saw began life as a single pale egg attached to a Milkweed leaf, it gives you some idea how much growing is done before each larva is ready to form a chrysalis, the next stage in a butterfly’s metamorphosis. 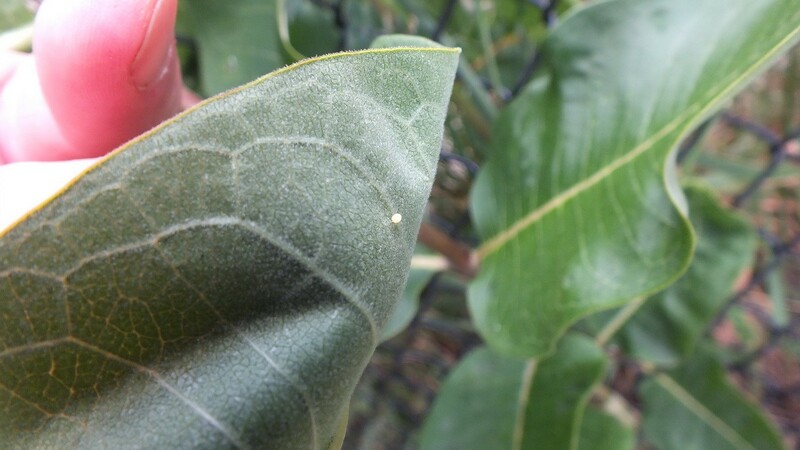 It only takes four days for an egg to hatch, and then the tiny caterpillars devour the ribbed eggshell and begin eating the milkweed leaves. Bob and I are so concerned about the survival of Monarch Butterflies that we were like adoring parents filming and photographing each and every caterpillar that we found. No matter that a gentle rain had begun to fall, we were on a mission to see how many Monarch larvae we could uncover. 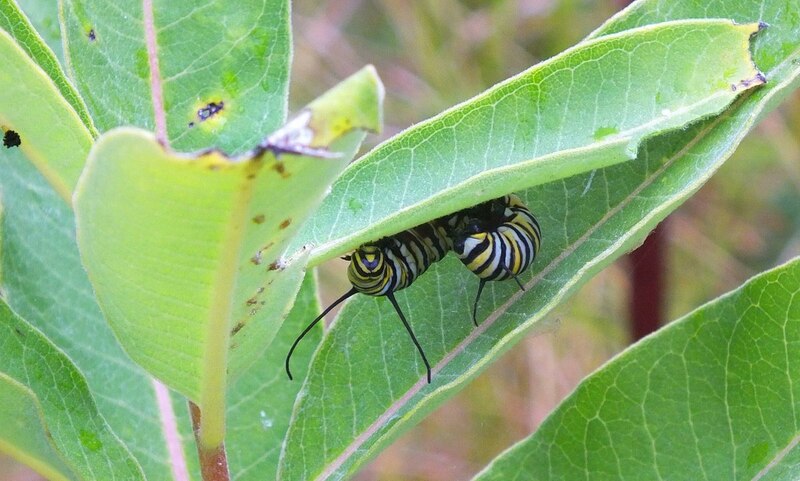 The larvae were equally as comfortable in the light drizzle and continued to chew their way through the Milkweed leaves. It is the white sap in the leaves that transfers to the caterpillars and eventually the adult butterflies the toxins that give a bitter taste to their bodies so that predators are discouraged from eating them. 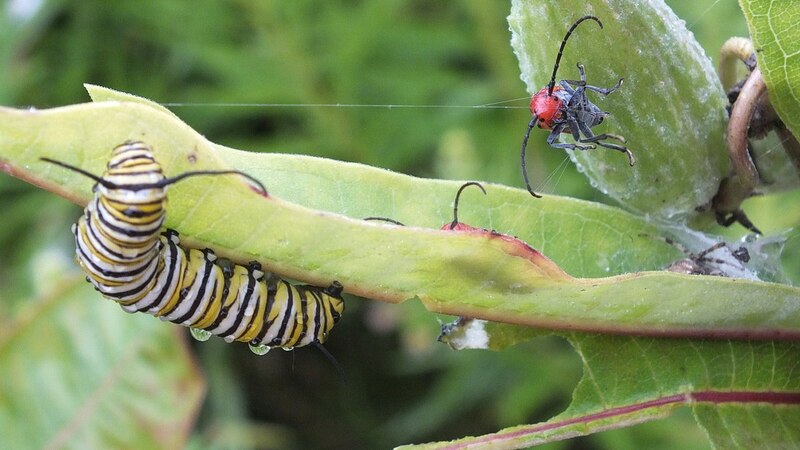 The distinctive colour of a Monarch Butterfly larva is easily recognized by predators who have developed an aversion to their taste. 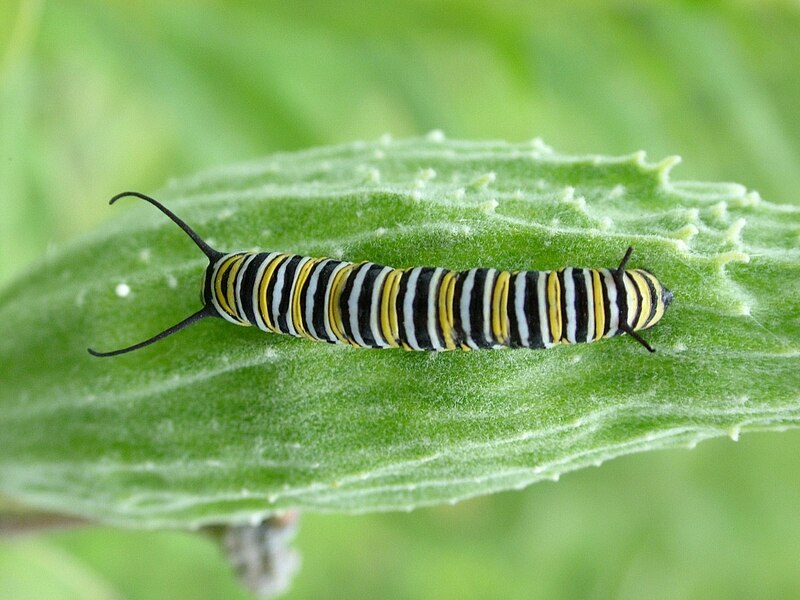 It takes two to three weeks of constant eating for a newly-hatched caterpillar to achieve the size necessary for the larva to pupate and then form its chrysalis. During that three-week period, the ravenous larvae eat, grow and rest and shed their skins no less than four times. I should have looked on the ground beneath the plants to see if I could find any discarded skins. A mature caterpillar will weigh one thousand times more than the egg from which it began life. Some of those that we found were about ready to begin the next stage of their development. At that point in time, each larva will attach itself to the underside of a leaf by spinning a silken pad to which the caterpillar will attach its hind legs and suspend itself upside down in a “J” shape. Once attached to a leaf or stem, it requires about one day’s time for the caterpillar to transform itself into a chrysalis. This is called pupating during which process the larva sheds its outer covering one more time to reveal the bright green casing that is the chrysalis. 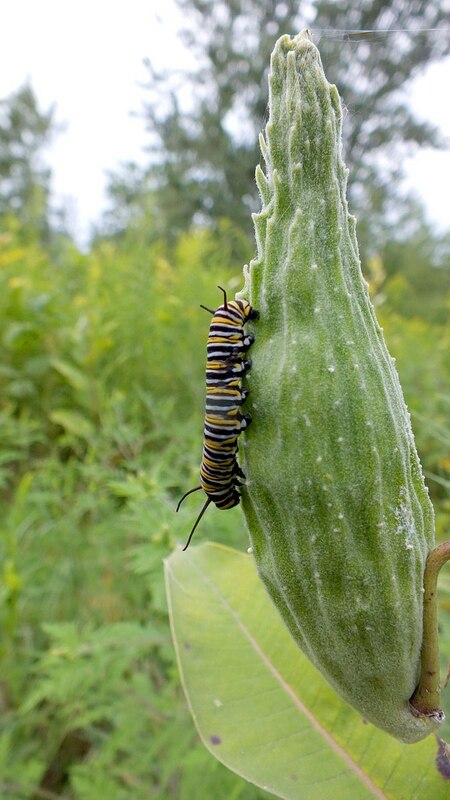 You can see in my photographs that the larvae have been busy chewing their way through the milkweed leaves. It was very tricky locating their hiding places when they were tucked between two large leaves. It made for a fun challenge, like playing hide and seek. Bob and I were in our element. 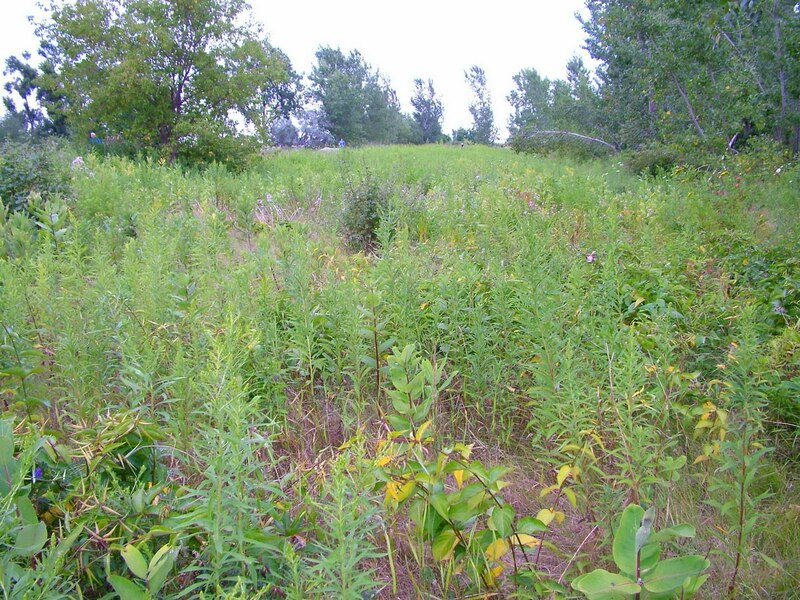 Once again, we could not overlook the fact that the invasive species called Dog-Strangling Vine was gaining a foothold there amongst the native Milkweed plants. 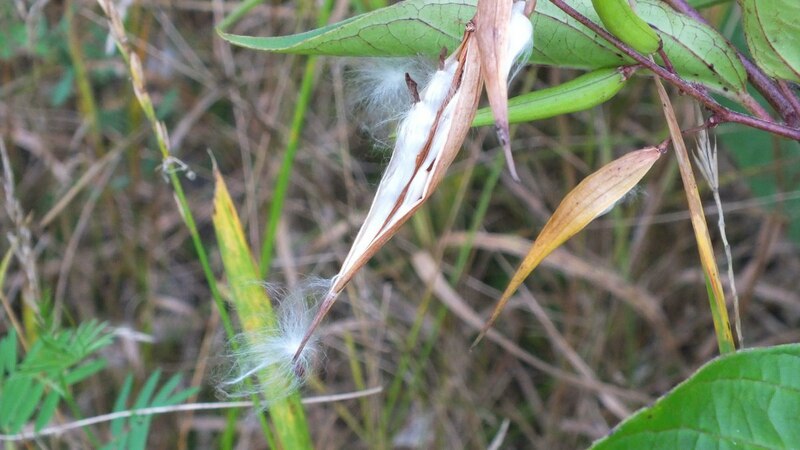 As mentioned in another of our blog posts, this hugely aggressive alien species can choke out many native plants including young saplings, but what is worse is that it is a member of the milkweed family. As such, Monarch Butterflies become confused and will lay their eggs on the leaves of this vine. Once hatched, the caterpillars are poisoned by the strong toxins in the leaves before they can complete their life cycle. The plants, themselves, spread when the wind disburses the seeds and also by sprouting new plants from root fragments. One plant can produce 28,000 seeds per square metre (10 sq. ft.). They are almost impossible to eradicate. 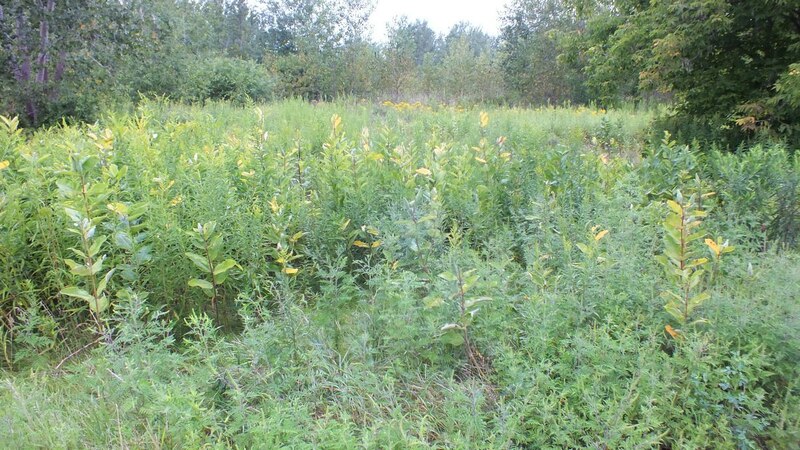 Once Bob and I had exhausted our search of one plot of Milkweed Plants, we moved further afield. 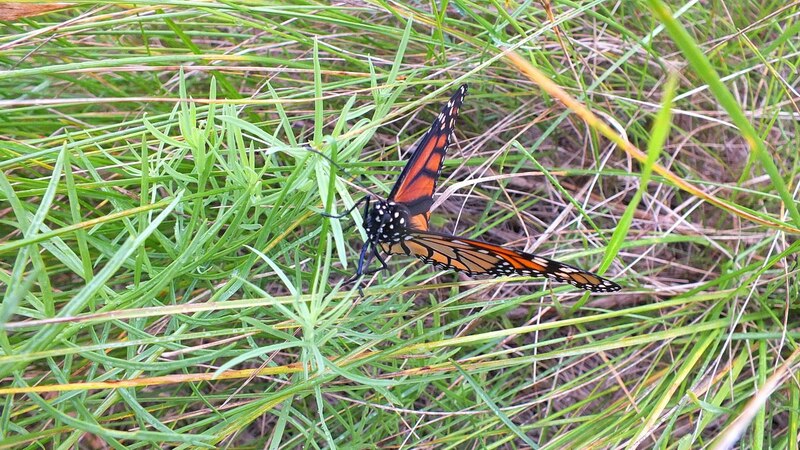 Our attention was drawn towards the sky when an adult Monarch Butterfly appeared out of a cluster of trees. The rain was peppering down a little heavier by that point, which led the butterfly to land in the long grass at one side of the trail. Butterflies are not capable of flying in the rain for a prolonged period of time. Most often, they will perch in a bush or tree where they are sheltered by overhanging vegetation. They remain there until the rain stops and the water evaporates from their wings. 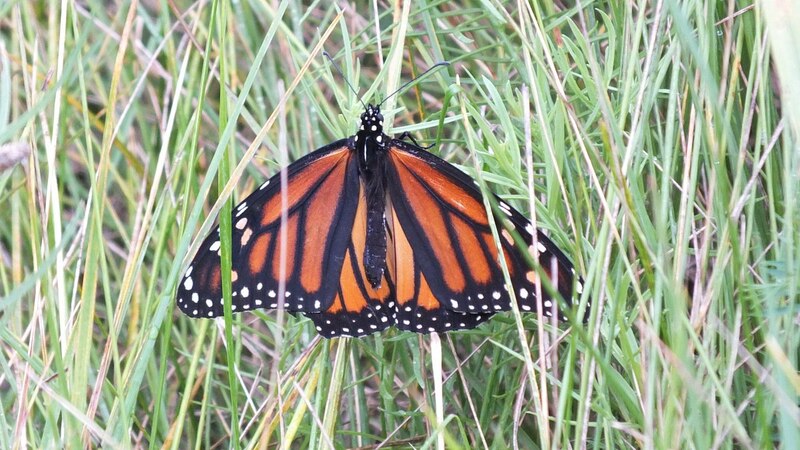 When a Monarch Butterfly’s wings become wet, they are too heavy for flying so a prolonged stretch of rainy weather can prevent a butterfly from seeking nectar and hence compromise its overall health. 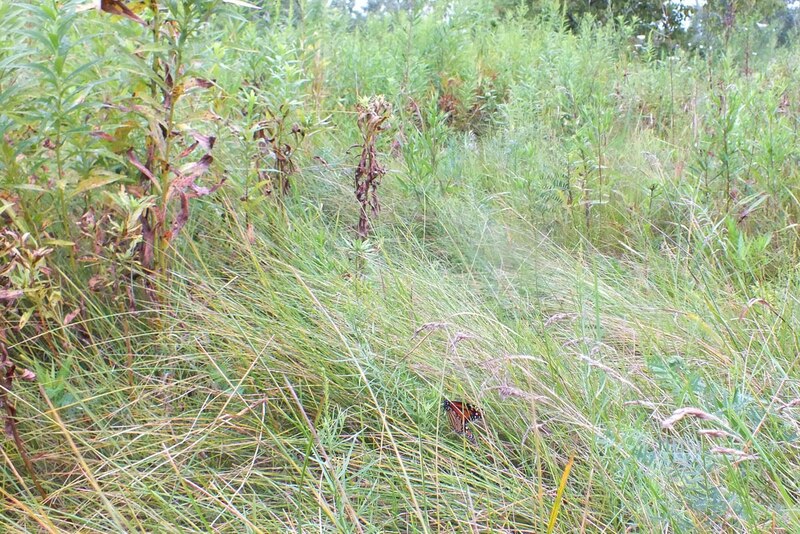 Bob and I moved on and left the Monarch Butterfly to deal with the damp weather there in the tangle of grass. With the onset of rain showers, Bob and I found the Park quite deserted. The slapping wet footsteps of the odd jogger could be heard in the distance, and the occasional cyclist cast a curious glance in our direction, but we had the tall, wet grasses to ourselves. 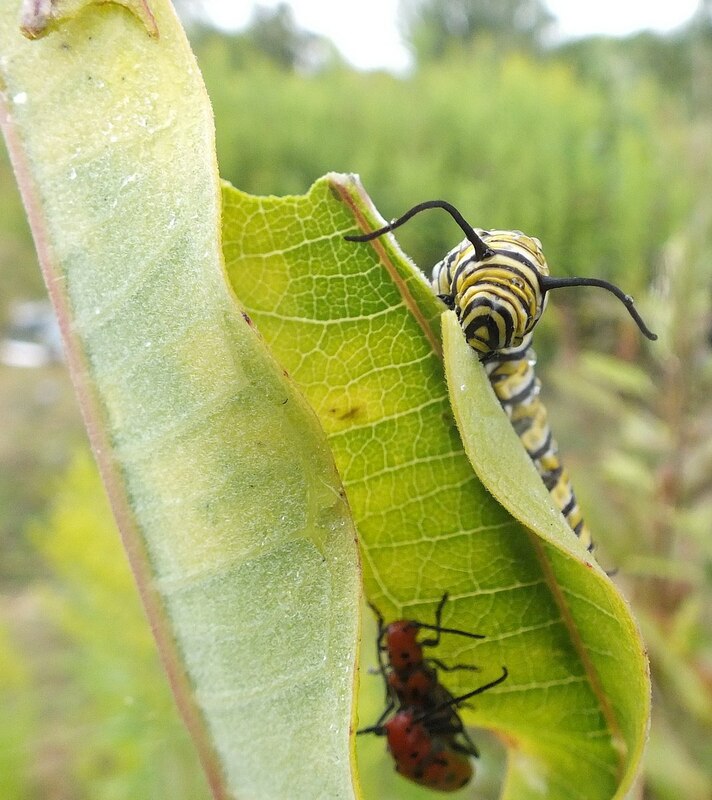 In another patch of Milkweed plants, we discovered five more good-sized larvae some of which were sharing the host plants with Red Milkweed Beetles (Tetraopes tetrophthalmus). We decided that it was time to head home after having been out and about for a good share of the day. We were extremely pleased with the results of our explorations!